Ford’s venerable F-Series truck has been a mainstay for the company since 1948. American’s love affair with the F-Series has continued to grow over the decades as Ford provides a dependable vehicle that can be used for all occasions today. In 1975, the F-150 was introduced as a stopgap between the F-100 and the F-250 to avoid being subjected to all of the new emissions regulations. There are more than 3.6 million 2009-’14 Ford F-Series trucks on the road today, and the majority of these are the F150 model. The 12th generation of the truck, and specifically its brake system, has had very few problems since most of the brake system was carried over from the previous platform. 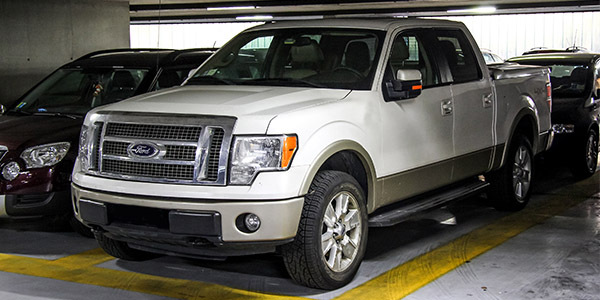 Ford did recall some 2013-‘14 F-150 vehicles equipped with 3.5L engines, manufactured from August 1, 2013 to August 31, 2014, due to a possible rolled rear cup seal on the master cylinder. The issue can result in brake fluid leakage from the primary reservoir into the brake booster and a complete loss of front brakes. When servicing F-150 models made in this range, be sure to pay extra attention to leaks around the master cylinder. According to the TSB (NHTSA Campaign Number: 16V345000), some leakage is acceptable, so techs should be on the lookout for excessive leaks. Trace amounts of brake fluid may appear on the booster shell below the master cylinder mounting flange. Ford says this is the result of regular lubricating action of the master cylinder bore and seal. If the pads are installed in the wrong positions, the caliper could come in contact with the inside of the wheel when the brakes are applied. The brake caliper bracket has a torque spec of 184 ft.-lbs. The caliper guide bolts have a torque spec of 27 ft.-lbs. 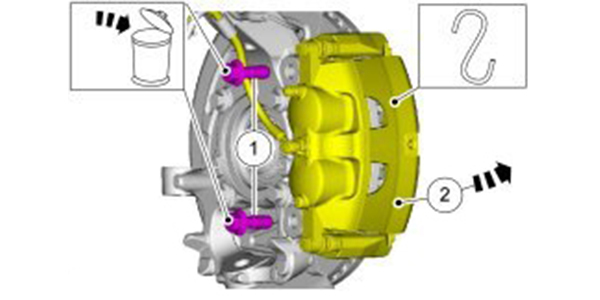 When you remove the rear rotors, inspect the ABS tone ring and the condition of the parking brake hardware: The actuators attached to the parking brake cables are known for seizing. Also, check for contamination from worn axle seals. If you see uneven inboard pad wear, it could be a sign that dirt or a rock may have lodged between the caliper and mounting plate. The caliper guide pins have a torque specification of 22 ft.-lbs. The upper guide pin has a dampener designed to minimize noise and vibration. This round piece made of rubber and metal is tuned to the natural frequency of the brakes. Aftermarket replacements are available. The parking brake uses a foot-operated parking brake control that is self-adjusting. 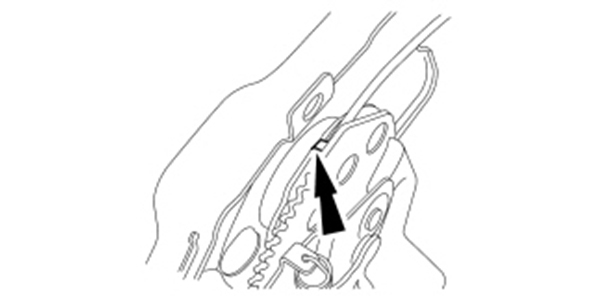 To release the tension, pull down on the intermediate cable at the cable-to-cable union on the frame until the parking brake control sector rotates to its stop and a 4 mm retainer pin can be inserted. Disconnect the cable at the union. 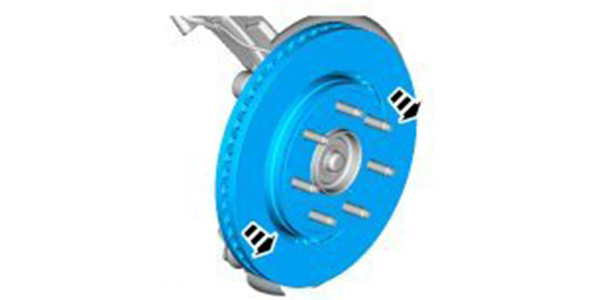 To adjust the parking brake shoes, measure the diameter of the inside of the drum part of the rear rotor. Adjust the shoes so they are 0.71 mm (0.027 in.) less than the inside diameter of the rear rotor. Connect the cables at the union and remove the pin from the parking brake foot pedal assembly. Make sure to inspect and measure the rotors for runout to confirm they don’t need to be replaced. The minimum thickness of the brake rotors on the front should be 32.0mm, and no less than 23.0mm (0.906 in.) for the rear. The brake pad materials should be a minimum thickness of 3.0mm front and rear, with a maximum taper of 3.0mm. If the friction material shows any signs of cracking or contamination, install new pads, as necessary. Essential torque specs to follow are the caliper brackets, which should be torqued to 184 ft.-lbs., and the caliper guide pin bolts should be tightened to 27 ft-.lbs. When the wheels are bolted back on, you should tighten them with a torque wrench (not a torque stick) to 150 ft.-lbs. If you’re located in the northeast and upper Midwest where there’s a steady supply of salt and brine on the roads in the winter months, there’s a good chance some of the brake lines may be rotted on the earlier model years of this generation F-150. Ford wrapped the steel brake lines with a rubber coating that may hold some of the moisture and salt against the lines causing them to rust faster than average. Also be sure to check for stuck front calipers from either rusty guide pins or pistons that are hanging up. If the problem is with the caliper, there are plenty of remanufactured options that are a lot easier than trying to rebuild a caliper. The Trailer Brake Control (TBC) module is an integrated electronic control device that is designed to provide variable braking power to the electric actuated drum brakes on a towed trailer. The braking energy provided to the trailer is a Pulse Width Modulated (PWM) signal that switches between 0 volts and battery voltage; the higher the duty cycle, the more braking power available. The TBC module is on the CAN Bus and it receives information from the stop-lamp switch, PCM, instrument cluster, BCM and ABS module. The TBC takes information from the module and sends the signal to the trailer. The main inputs are the brake pedal position switch, pressure transducer on the ABS modulator and the TBC switch panel. The biggest issue with the TBC are the connections between the modules and trailer. The most common problem is the “no trailer” or “trailer disconnected” message in the instrument cluster. The most common cause is the 7-pin connector and continuity problems. These are related to the ignition cycles. 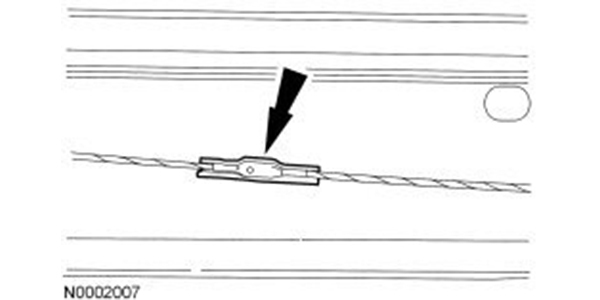 If the message “Wiring Fault on Trailer” appears, it means the trailer brake signal wire is shorted to ground.